Assassin's Creed IV: Black Flag Review - A Pirate's Life for Me. » Assassin's Creed IV: Black Flag Review - A Pirate's Life for Me. There has been one time in my life that I was on the open seas. There was water in all directions, the moon hung high in the sky, and the air was cool and crisp. Above me, the sky was illuminated by countless stars, undiminished by the encroachment of a city or the pollution of lights. If there was anywhere in this world where someone could truly be alone, this was it. It was simultaneously beautiful and horrifying. Now, unfortunately, I was on a cruise ship, so not exactly the perfect scene when you pull the camera down a bit. Nowadays, people can only do this if you’re rich with a sailboat, or if a distant relative devoted their entire savings to buying a boat and you get to ride on it. Besides the modern day ones who have no honor or code, the true pirates are all gone. It’s sad really, what a noble pursuit, to live free from a nation or government. To fight for one’s own beliefs and live by a code, a creed if you will. This profession is something not widely examined by the mainstream gaming industry. Like the western, it’s an untapped genre. Now, one of the biggest franchises of the last generation makes the leap to PS4 with Assassin’s Creed IV: Black Flag. The series has gone from the crusades, to the renaissance, to the American Revolution, and now to the golden age of pirates. This game really gets around, and with the latest release, the series has found a new life on the PS4. Assassin’s Creed has always had two stories running alongside one another. One takes place in a semi futuristic setting where a man named Desmond miles has been kidnapped by modern day Templars who have a massive multi-billion dollar corporation called Abstergo Industries. The series follows Desmond’s forays into the memories of his ancestors using a machine called The Animus. Through his own DNA, Desmond is able to use this machine to unlock the memories stored in those genes and relive them. For fans of the series, a lot has happened, and apparently we’re just getting started. I won’t spoil anything, but suffice to say, if you were scratching your head at the end of Assassin’s Creed III, don’t expect any answers from the get go. The future story starts out confusing and very slowly, but surely begins to trickle out answers. As usual, it provides a nice framework for the rest of the game, which makes up the majority, and while you’re outside the Animus, there’s still plenty of secrets to find and uproot. This particular game focuses on a man named Edward Kenway. 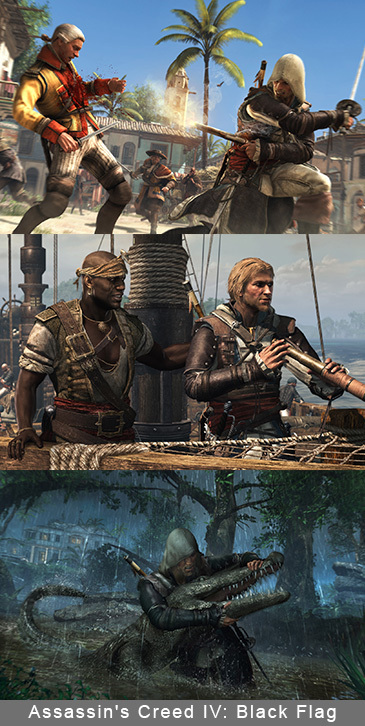 He is the grandfather of the previous game’s protagonist Connor, so this game moves backward from the revolutionary setting in favor of focusing on the caribbean and the golden age of pirates. The story is paced far better this time around, with the opening starting strong and the tutorials kept brief. For those who loathed Assassin’s Creed III’s four hour tutorial, this will be a breath of fresh air. That being said, Edward is most certainly more likeable than the brooding protagonist of the last game, but I still think he falls short of the standard set by Ezio, the italian renaissance assassin who starred in the three games before Assassin’s Creed III. Nonetheless, Edward’s story moves fast and keeps you engaged with plenty of twists and turns. It’s not an on-the-edge-of-your-seat kind of story, at least not every mission, but it provides a good character arc for him, and once you have access to a ship and the open sea, you’ll find yourself distracted by the many side activities the game has on offer. 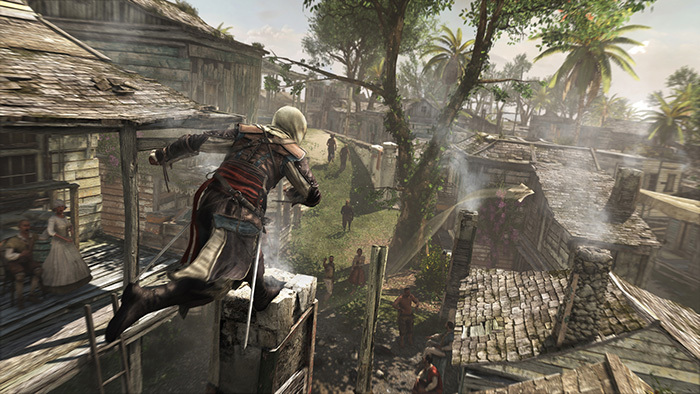 Assassin’s Creed has prided itself on a system of free-running and parkour that is unrivaled in the industry. These guys once made Prince of Persia, so acrobatic platforming is something they are quite accustomed with. Putting those same mechanics in an open world is a daunting task and they’ve managed to craft a system that works, most of the time. Almost identical to the previous games, the controls involve pressing and holding the right trigger to go into a high profile mode where you sprint and automatically scale obstacles and climb ledge as you encounter them. Pushing up while holding the trigger will have Edward reach for handheld, leap to the next ledge, and so on with no further input from the player. While the controls have seen some tweaks over the series, they have remained largely untouched, which I find odd. One of the most blatant issues is that on many occasions, when leaping from one ledge to another, especially one behind or away from the character, will be read by the game in a different direction than where the player was pointing. This means you can high on a cliffside and go to leap backward, only to jump right instead and fall to your death. The controls are basic, and rely on basic inputs. This is both a blessing and a curse. Never before has a single control scheme so seamlessly blended this many kinds of movement into one simple to use formula. It also relies on context sensitive controls which change the button inputs based on your surroundings. The fact that it works most of the time is a huge accomplishment because it allows the focus to remain on what’s happening around the player, as opposed to trying to keep up with complex button commands. On the other hand, the fact that seven plus games have gone by, and the system still has major flaws in movement recognition, is a major downer. Granted, it’s not broken, but at least try to tweak it. With an open world game like this, it’s impossible to not be distracted by something. Assassin’s Creed IV offers a world so in depth that I couldn’t possibly cover it without a separate segment of the review. These games have always had lots of distractions, but this game takes the cake. The usual suspects are here like assassination missions, and collectibles to hunt. Beyond this though, the game carries over the previous hunting mechanic from the third one. Edward can hunt all manner of wildlife, and now sea life. He can use the supplies he gains from the bodies, like skin and bones, to craft new upgrades much like the recent Ubisoft release, Far Cry 3. You may have raised your eyebrows when you heard sea life, so I’ll elaborate. The game allows you, while sailing through the open ocean on your pirate ship, to drop anchor and take a whaling boat out into the water. From here, you can use harpoons, which are upgradable, to spear animals like sharks and whales. They come in all shapes and sizes, and these open sea hunts are both intense and immensely rewarding. Speaking of the open sea, Assassin’s Creed IV features a fully explorable Caribbean with islands, other ships, and sunken wrecks to explore. The game offers so much at once that it can be overwhelming. There’s no denying the satisfaction that comes from dropping anchor and exploring an uncharted island, finding viewpoints, animals to hunt, and even buried treasure. On the open sea, you can challenge other ships in intense naval battles. When they become disabled, you can board them with swords in each hand and take out the crew, taking the ship’s goods for yourself and offering any men left the opportunity to join you. In addition, you can assault enemy forts, bombarding them with cannon fire before seizing them on foot and taking all they have. These impromptu battles are intense, exciting, and infinitely fun to initiate which is a testament to the polished and reliable ship controls. There is never a lack of things to do in Assassin’s Creed IV, and that is truly an accomplishment. The game even includes a fast travel system for those times you need to get somewhere fast. 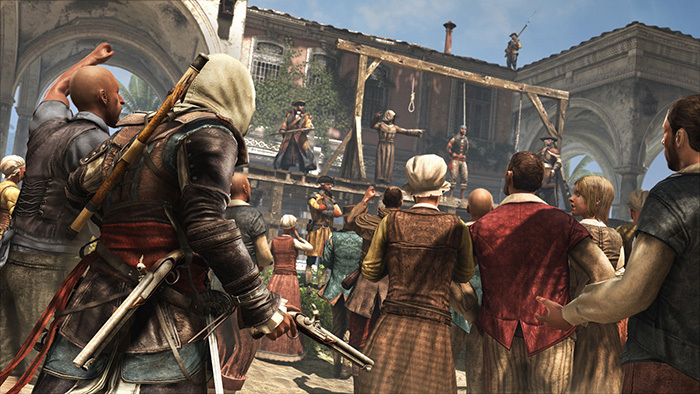 Assassin’s Creed introduced multiplayer with the third game in the series, Brotherhood. The mode was simple, players were given a target and a “hot” and “cold” system to find their whereabouts. Problem was, the map was populated with many characters that looked like the target. For the player, the goal was to see who stood out from the crowd. At the same time, other players would be given contracts to hunt you, meaning you too had to pretend to blend in. It was a cool game of cat and mouse, and the premise remains the same in the new game. The new maps are well designed without being overly large. Players can break into teams, going on both the defense and the offense. Other modes include a cooperative type called Wolfpack, where players can work solo or together to take out NPC targets. This isn’t going to be a Call of Duty killer, but the multiplayer continues to evolve and serve as a unique distraction from the single player or a reason to keep coming back once the story is completed. For the sake of comparison, I played Assassin’s Creed IV: Black Flag on both the PS3 and the PS4. It goes without saying that the game feels truly at home on the PS4, with incredible water textures and physics, amazing shadows and details, and a rock solid frame rate that never dips. On the PS4, this game is simply gorgeous and performs like a dream you never want to wake up from. On the PS3, the game is perfectly playable, but the difference in graphics is very noticeable from the beginning. The performance is not as smooth either, with major cities causing frame rate drops consistently. It looks rough around the edges on the past generation console, but it is still a great game. If you have the opportunity though to play it on PS4, I would highly recommend that version over the other. I’ll be honest, I was disappointed with the last Assassin’s Creed game. Black Flag has renewed my hope in the series with a positively massive entry that is brimming with awesome ideas and great new gameplay elements. The story continues to keep me coming back again and again, both for the past and present day elements. This is a series that continues to evolve and try new things with every entry, and for that I love it dearly. Will everyone love this game? No, and it’s certainly not perfect, but if you are a fan of the series or you have a love of pirates and the history of their reign, then Assassin’s Creed IV: Black Flag is calling you to unite under its banner. My advice? You should listen, or be faced with walking the plank! Have you played the game yet? Are you on PS3 or PS4? Tell what you think of it in the comments! Thank you to all who commented on Facebook with your valuable input and direction. I've taken your tips and a few of my own for good measure and now they will be displayed for all to see. Who needs a strategy guide when you've got PS4Experts, am I right? Of course I am, now let's get started. #1 - Upgrading your ship is paramount to success. We know that the game throws a lot of upgrades at you, but remember always that this is a pirate game. You spend more time on your ship and in ship combat than you do on land. Because of this, we recommend you gain as many ship upgrades as possible before diving into the pistol and sword upgrades. #2 - Don't go near the Legendary Ships until the time is right. In the four corners of the map, you'll encounter four legendary ships in the game. They aren't call legendary because it sounds nice, these things are strong. We recommend staying far away from them until your Jackdaw is fully upgraded. Any attempts before this are suicide. You have been warned. #3 - Find the Mayan stone, become bulletproof. Step three, profit. While we can't guarantee that it will make you money directly, finding the hidden Mayan stones in the game will grant you a Mayan costume which also has a great benefit; it protects you completely from bullets! Yeah, you're going to want this as soon as possible. #4 - Hunt, skin, harpoon, just kill everything that moves. Many of the upgrades need raw materials to become available. When you're sailing the open sea, you can see seas animal icons in places where you can go out and hunt whales, sharks, and the like. In addition when on land you can hunt all manner animals and skin them for materials. Pro tip, crocodiles can be put to sleep with darts and skinned while they're unconscious. Cruel? Perhaps, but if you've played games, you know that those jerks have it coming. #5 - Viewpoints are like being the government, only less creepy. Since they didn't have satellites or the Xbox One back in Edward's time to spy on people (got 'em!) you can use the viewpoints in the game to not only unlock more of the map, but it will also reveal chests, shops, and other collectibles on your mini map. This is also true of forts which reveal the ocean around them when they've been taken over. Of course, the forts shouldn't be tackled until you've gotten some upgrades first. #6 - Stray cargo and shipwreck survivors add up. When you're sailing the open seas, don't simply pass by the floating cargo and the stranded people in the water. You can pick them both up with a button press as you pass by them. They don't add much, but they do contribute to the respective resources, and like pennies, they add up. #7 - Don't rule out the Kenway's fleet meta-game. When you visit Edward's cabin in the Jackdaw, you can examine the map in the center of the room to trigger a little meta-game called "Kenway's Fleet." Very similar to the assassin missions introduced in Assassin's Creed: Brotherhood, you can send captured ships on trade missions or to battle using the menus here. Doing so allows you to make extra money on the side each time they finish a mission. Best of all, it's all done while you continue on your own path so it's almost like free money. #8 - Eagle vision points out not only enemies, but also animals and hiding spots. The iconic Assassin ability is Eagle Vision which allows the assassins to see the true intentions of people around them. In past games, and this one, it can be used to differentiate friend from foe, keep track of a target, and spot hiding places. Now in the new game, it will also highlight animals hiding in trees and bushes. This is a great tool to use in almost any situation and provides a major tactical advantage. #9 - The gun is mightier than the sword! The guns in Assassin's Creed IV are powerful in the sense that nothing in the game can effectively block them. When stuck fighting a strong enemy or an officer, instead of trying to break their guard or counter their attacks, just pop a cap in them and call it a day. Some officers will block even your counters so this remains the top method for dispatching the more annoying foes. #10 - Stop to smell the roses. Don't beat the game, experience it. Possibly one of the best tips from our dear readers, and one I fully endorse, is that you should take time to see all that this incredible game has to offer. Everything from hunting, to diving missions, to fort battles, to even assassination missions are worth doing. Taking time to deviate from the story will net you even more unique experiences, and a ton of extra cash and supplies to boot. Even if you're the kind of person that only does the main story, I implore you to really explore and see what this game has to offer. The sires will never die that's what i'm talking about heck yeah!!! Assassin's Creed IV: Black Flag bundle?? How much is the cost for Assassin's Creed IV: Black Flag bundle?